The Pearl Diver Mouse is a breed of mouse found in the Sunken City. It is known to drop a variety of loot. A precious mouse seeking precious pearls. He snorkels searching for a pearl that is just as unique as he is. There is something about their pearly texture that just makes it feel like everything is right in the ocean! Pearl Diver, he's been down too long in the midnight sea. His friends wonder what is becoming of him. Shiny pearls, white and yellowish colour in hue, the Pearl Diver is coming for you! The Pearl Diver Mouse has no specific preference for any kind of cheese. The Pearl Diver Mouse is susceptible only to Hydro weapons. It can be found in the Pearl Patch and Sunken Treasure zones while on a Dive in the Sunken City. The Pearl Diver Mouse drops the Deep, Deep, Deep Egg, the Sand Dollar Egg, and the Sunken Treasure Egg during the annual Spring Egg Hunt. 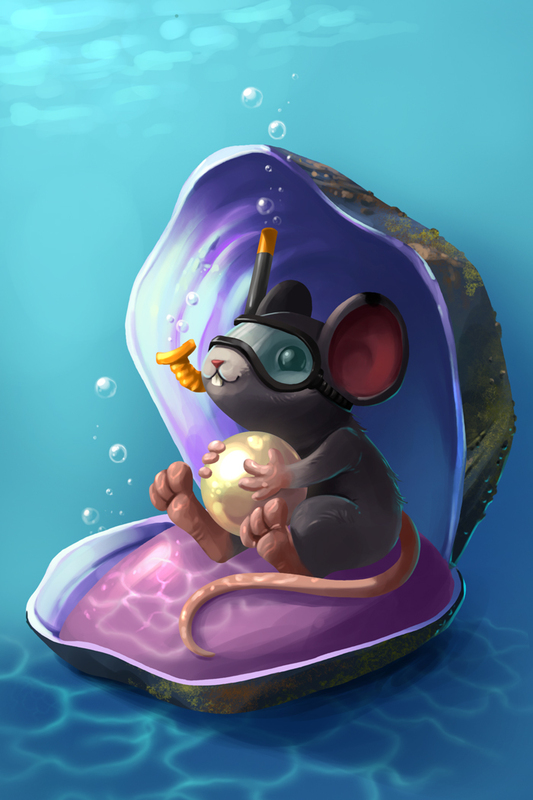 The Pearl Diver Mouse was released 2 July 2014 as part of the Sunken City content. This page was last edited on 27 May 2017, at 02:03.